The inspection of the mains gas pipelines to detect the presence of the pipe walls' damage caused by stress-corrosion is carried out with the help . This defectoscope is developed and fabricated at MSIA 'Spectrum'. The principle of this instrument operation is based on the magnetic field leakage method. Magnetic defectoscope provides detection of flaws on the gaspipeline wall' surfaces. The detected flaws are as follows: local and continuos corrosion, cracks of longitudinal and angle orientation, groups of cracks. The -'KOD-4M-1420' also provides detection of various flaws combinations, for example, corrosion and cracks, scratches with cracks, dents with corrosion. The detection threshold level equals to 0.12T - 0.2T, where T - is a wall thickness. The problem of early detection of stress-corrosion in walls of gas pipelines is very important. Timely location of poor areas will help to avoid costly brake downs of gaspipelines, as a rule, operating in tough environmental conditions.. Usually stress-corrosion arises in the points of tension concentration (stress concentrators) that, in there turn, may have different sources of origin: mechanical (scratches on the metal surface, riveting on and residual stresses of pipe wall), chemical (metal corrosion in the media of soil electrolyte, cracks formations - the flaws due to metal structure), etc. Great definition magnetic defectoscope 'KOD-4M-1420' was purposely developed to solve the above described problem. In the instrument realised the principle of transverse walls magnetization with further information pick up. Collected data contains the information about the condition of wall' material. The basic principle of measurement is a registration of the magnetic field distribution near the inspected internal surface of the pipe. The inspection has resolution enough for analysis of the parameters of the magnetic field leakage caused by the defect with the following defects classification and estimation of there geometrical parameters. The accuracy of parameters and sizes defect gauging is of great importance for the following evaluation of gas pipeline residual life. The intelligent-pig 'KOD-4M-1420' provides detection of defects of known shape and origin in the tube wall, i.e. those defects that finally cause damage of the metal continuity. To locate defects the method of magnetic field leakage is used, all measurements and registration are carried out in the applied constant magnetic field magnetizing the wall up to the induction level of 1.6 - 1.8 Tl. During research and experimental works over the defectoscope the theory of the method of the magnetic field leakage caused by the defect in case of transverse applied magnetic field has been developed. The mathematical models of the pipe wall defect were worked out as well. These models simulate the following types of defects: longitudinal cracks of final length, groups of short numerous cracks forming stress corroded areas, different types of corrosion, as well as defects combinations causing stress corrosion cracking. The defect mathematical model presents the functional relationship between the values of the field in some points (X, Y,Z) of space over the defect and its geometrical sizes (depth, length, width). The classification of defects and estimation of there parameters are based on the measured over an examined area values of components of the magnetic field. The automatic processing of data collected during the defectoscope travelling in the pipe is done with the help of specially developed software package. The software automates the following options: defects detection within the pipe, defects classification, parameters calculations, defect positioning within the pipe and along the pipe. Also with the help of the software it is possible to carry out analysis of the defected area within any type of coordinates and to present the information about examined parts of the pipeline in the most convenient manner. Additionally to the mentioned above their is a software to calculate the parameters of the pipe profile. The defects sizing is carried out with taking into account the current operating modes of the defectoscope, i.e. the parameters of media within the pipe and the speed of the 'pig' travelling (it can be up to 6 m/s). During travelling inside the pipe the next parameters are measured: the magnetic field parameters, the speed of travelling, level of the wall magnetization in the area free of flaws, defectoscope angular displacements. At the same time some parameters are calculated, these are: the momentary travelling speed over the circular like non-unifromities, average travelling speed in each 10 sm., tubes length and defects coordinates. The defectoscope has explosion proof and low temperature performance. 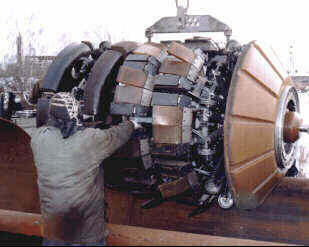 The 'KOD-4M-1420' was used during winter time for inspection of part of the 'Urengoj-Center 1" gas pipeline (operator - PO 'Tyumen'transgas'). The typical defects detected during that inspection are presented in figures 1, 2 and 3. The magnetic defectoscope ('Intelligent pig') -'KOD-4M-1420' Fig 1: The picture of the defect - stress corrosion cracking appeared on the pipeline surface during gas pipeline operation under rated load. 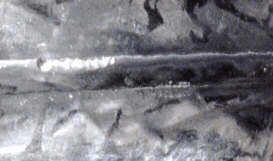 Fig 2: The picture of damaged are in the zone of longitudinal welded joint with cracking.The cracking is in the plane of fusion of weld joint metal and major tube metal. 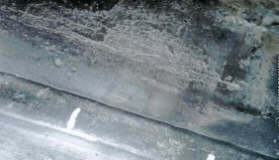 Fig 3: The picture of defect like family of stress corrosion cracks near the longitudinal welded joint in combination with the corrosion - chemical stress concentrator. From the figure it is clear, the cracking in the wall metal in the area of stresses concentrators of various origin are accompanied by combinations of some defects: corrosion + crack, scratch + crack, dent + corrosion + crack, longitudinal welded joint (actually this is not a defect, but detectable and noticeable area inside the pipe) + cracks along the fuse line. 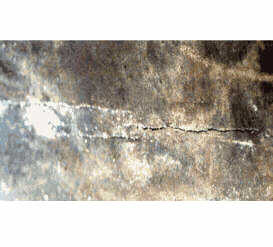 The detection of such areas is possible only due to the specific features of the cracks like defects. More accurate detection of the flaws combination and evaluation of there summarized depth are done by means of special software based on the worked mathematical models. Software realize the algorithm of mathematical description of the physical influence of the background defect on the parameters of the magnetic field leakage caused by main flaw - the crack. The defectoscope 'KOD-4M-1420' is equipped with the system of defects coordinates determination as well as by the system establishing the correlation between the positioning of the device inside the pipe and some surface landmarks over gas pipeline. Basing on the results of travelling parameters gauging the length of each separate tube and the total length of the examined part of pipeline are calculated. During calculations the corrections are done to take into account the errors contributed by internal systems. Very good and accurate results in defects coordinates detection are achieved due to the last one. Detected with the help of intelligent - pig 'KOD-4M-1420' flaws of stress corrosion type and combination with the other flaws-stress concentrators were proved by results of open test. After the defectoscope passed the inspected part of pipeline and results collected during travelling were decoded the tubes with defects were pointed out and excavated. Open tests were done with the help of ultrasonic means and there pictures are presented in figures 1 - 4.